Chemical Constituents and Components : Main chemical components are saponins (glucopyranosyl galactopyrans, ruscogenin, hecogenin, diosgenin), sterols, flavonoids, fatty acids and tannins. Saponins: 1. It increses the level of various steroidal harmones (includes testoeterone, DHEA and estrogen). 2. It stimulates the LH (lutenizing hormone) release from the pituitary gland. 3. It dilates the coronary artery and coronary circulation. 4. It causes significant decrease in peristaltic movement of muscles. 5. It shows potent antifungal activity. 6. It shows cytotoxic effect on tumour cells by inducing apotosis. Protodioscine: 1. It is converted into DHEA (De-Hydro-Epi-Androsterone), a steroidal body hormone. Curing Diseases : 1. It is used to enhance muscle strength and sexual potency. 2. It serves as a diuretic and a mood-enhancer. 3. 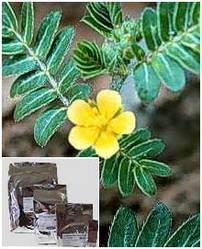 It has been popularized as a natural remedy to enhance libido and fertility in both men and women. 4. It is used in building immune system. 5. It shows anti-bacterial, anti-malarial and anti-fungal properties.